by Jan Kučera, last updated: 8/4/2013. This project costs my personal free time. If it helps to save your time, please support its development. 434 downloads, 9 donations – thank you! Updated user interface, most of the non-working controls removed. Ability to open and preview already generated font. Ability to preview light text on dark background (by clicking on the preview). Added the very useful predefined group of Czech characters. Displayed properties of the generated font, including final file size. Ability to send feedback directly from the app — report what does not work! The tool is available archived (415 kB, ZIP) or directly (533 kB, EXE). Requires .NET Framework 4.0. 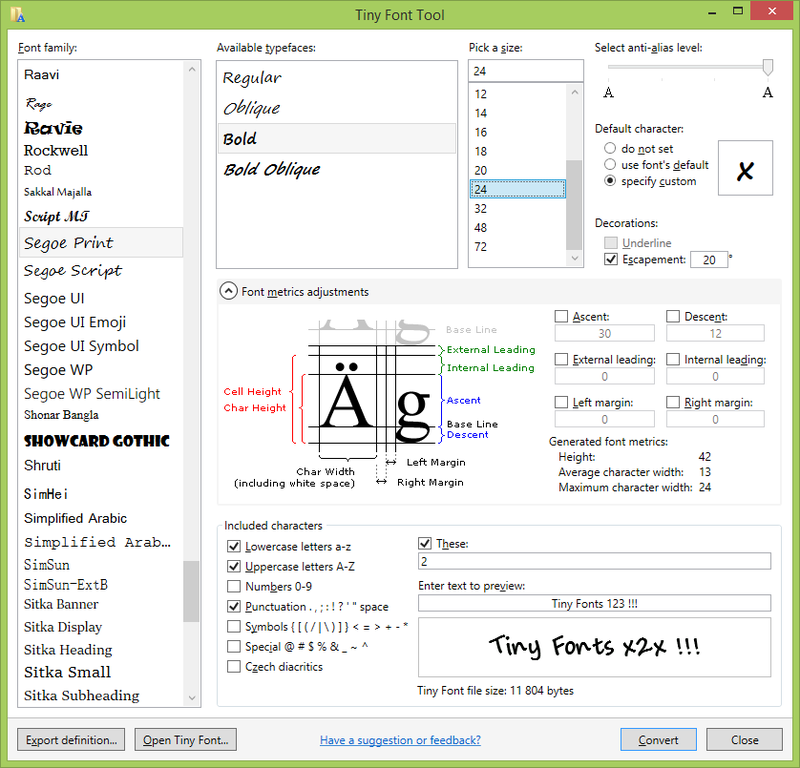 Only installed fonts supported (AddFontToProcess not utilized). Offsetting the characters is not supported (OffsetX and OffsetY not utilized). Entering characters or character ranges using Unicode codes not supported. DPI scaling is not supported on Windows Vista and older. You would need to disable it in the compatibility settings. The previous version requiring TFConvert is available upon request by e-mail. Sign in using Live ID to be able to post comments.